Chippewa Animal Clinic - Chippewa Animal Clinic (906) 635-5814 is the Sault area Veterinary Hospitals best choice. Chippewa Animal Clinic is now accepting new clients! If you are interested in becoming a part of our family, use the button below to schedule your first appointment! Come meet our staff and experience everything we have to offer! Want to share your experience? Use the button below! Are you a member of our VIP Wellness Club? Regular preventative care is essential to your pet's continued health. Our new wellness plans save you money on the total cost of recommended preventative care and treatments. Best of all, these plans feature budget-friendly monthly payments - making it easier than ever to manage your pet's healthcare costs! Join our VIP Wellness Club today and FREE VACCINES FOR LIFE is our gift to you! Check out our new, easy online store! 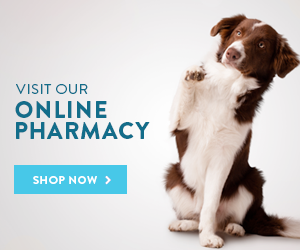 Get your pet's medications, food, and more shipped directly to your door! Fast shipping, great savings, and all products are 100% guaranteed! Click the link to get started today! Enjoy $5 off your first order when you use the code welcome64 during check out! Due to the Canadian dollar, we will be offering an exchange rate of 0.85 for CASH transactions only! We're hoping this helps our clients north of the border! We also accept Canadian payments of MasterCard, Visa, American Express, Discover, PETCARD, and cash. Unfortunately we can not accept Canadian checks or debit cards without the MasterCard or Visa logo on the front of the card. We apologize in advance for any inconvenience this may cause.